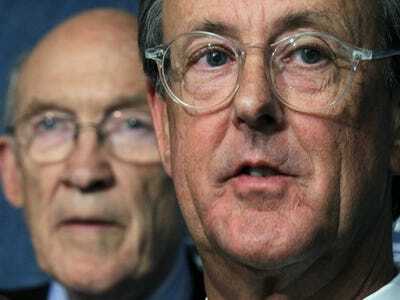 Former Republican Sen. Alan Simpson and former White House Chief of Staff Erskine Bowles are out today with a new plan to cut deficits by $2.4 trillion over the next decade.As the co-chairmen of President Barack Obama’s deficit-reduction commission, Simpson and Bowles proposed a bipartisan plan of tax increases and spending cuts that failed to catch on with the administration and Congressional leaders. Following the failure of their initial proposals, the pair detailed the new deficit-reduction strategy — called A Bipartisan Path Forward to Securing America’s Future — as across-the-board sequestration cuts loom next week. 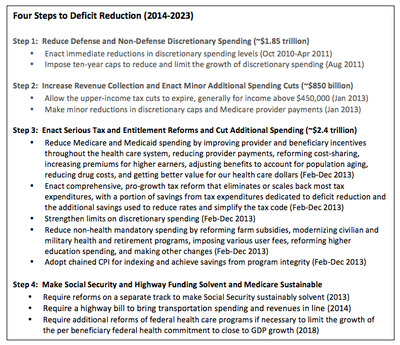 An initial goal of their new plan is to avoid sharp austerity by averting the sequester. At the same time, they seek to bring the national debt below 70 per cent of GDP by the beginning of the 2020s. The package reduces the number of tax expenditures but lowers the marginal rate for individuals and corporations. Gain roughly $600 billion through tax reform:Eliminate or scale back most tax expenditures A portion of these tax expenditure savings would go toward $600 billion in deficit reduction The remainder would go toward cutting the effective corporate and individual tax rate. The remainder would go toward cutting the effective corporate and individual tax rate. 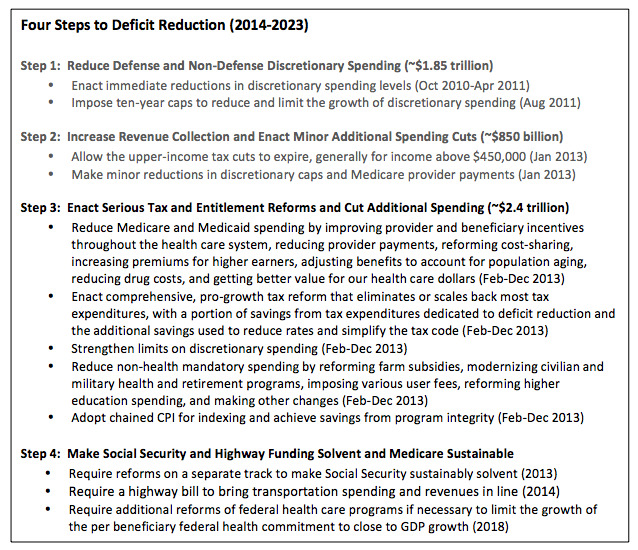 Gain roughly $1.2 trillion from:Lowering caps on discretionary spending Cutting farm subsidies Changing civilian and military health and retirement programs Adding fees Cutting spending on higher education Adopting chained CPI as the new index for cost of living increases, slowing the inflation adjustment for Social Security and other programs. Adopting chained CPI as the new index for cost of living increases, slowing the inflation adjustment for Social Security and other programs. The next step of the program will address infrastructure investment caps, cut the federal health commitment to close to GDP growth and enact Social Security reform.